Two articles in The Wall Street Journal’s October 22, 2018 special report on Wealth Management featured quotes from Megan Fox Kelly. The first, titled “Art Collectors Remember the First Time,” describes how an initial art purchase can have sentimental value far beyond the actual price. And, that first purchase also offers lessons for future investments. Some collectors find their first piece of art by chance. They walk past a gallery and something catches their eye. Others may use a methodical approach, or just buy what a professional tells them they should. Regardless of how it was acquired, a first piece often holds more sentimental than monetary value. And it is an entry into more serious collecting that comes with a host of lessons. “Many times, collectors have sentimental attachments to their first acquisitions, and they have a strong desire to keep them, perhaps to remind themselves of where they began, or of a particular time in their lives,” says Megan Fox Kelly, an art adviser in New York City. 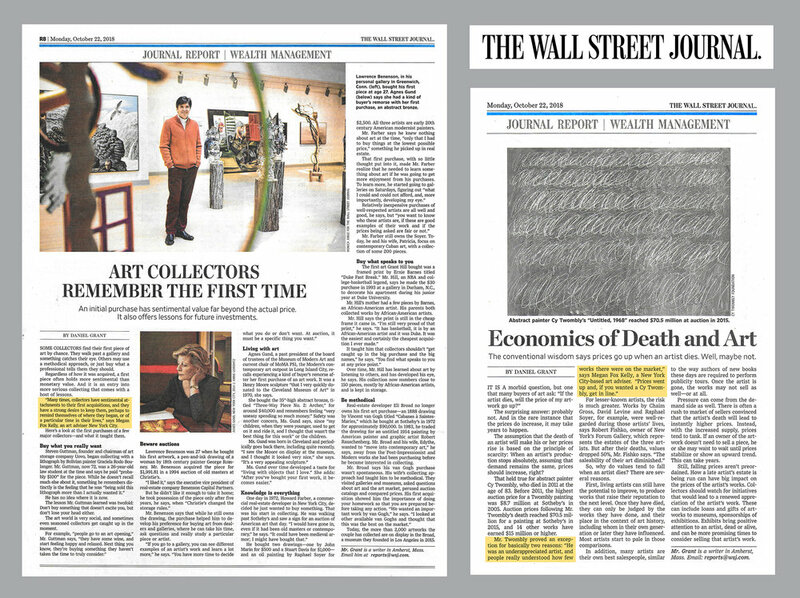 A second story in the same special Wealth Management report highlighted Kelly’s understanding of what happens to the value of an artwork after the death of an artist. The surprising answer: probably not. And in the rare instance that the prices do increase, it may take years to happen. The assumption that the death of an artist will make his or her prices rise is based on the principle of scarcity: When an artist’s production stops absolutely, assuming that demand remains the same, prices should increase, right? That held true for abstract painter Cy Twombly, who died in 2011 at the age of 83. Before 2011, the highest auction price for a Twombly painting was $8.7 million at Sotheby’s in 2005. Auction prices following Mr. Twombly’s death reached $70.5 million for a painting at Sotheby’s in 2015, and 14 other works have earned $15 million or higher.